It is amazing sometimes how the simple things in life are sometimes the best things. I have been to fancy restaurants and had fancy meals and they didn’t always taste that great. Then I have eaten something that was ridiculously simple and easy to make that tasted like a million bucks. That is kind of how I feel about these shrimp. Very simple, only a few ingredients and easy to make, but so delicious that you just can’t stop eating them once you start. The other day I was talking about some of our Christmas traditions as far as food is concerned. Another one of them is that on Christmas Day we always have my famous steaks and fried shrimp. This year we added these green beans to that menu and it was perfect. 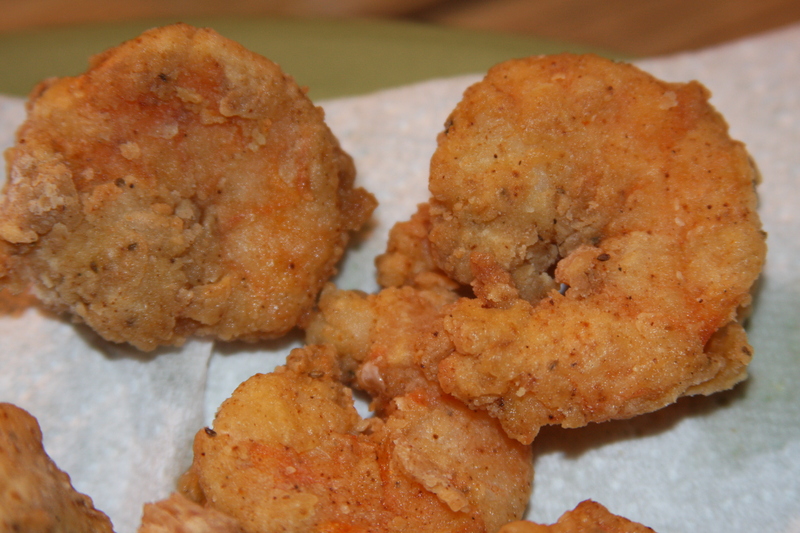 If you like shrimp you will definitely love these and if you really want to impress your family and friends, this is just the recipe that will do it! If you try it, let me know, I would love to hear what you think! ** To make this gluten free just skip the flour and use only corn starch. The ketchup I used is not gluten free, but there are varieties out there that are that you can substitute. The horseradish and Old Bay seasoning are gluten free. Then you need some uncooked shrimp. I usually buy these frozen at my local wholesale club, just because they are cheaper and I always have them available when I get the urge to make them. I just let them thaw and then peel off the shells and rinse them off. These are the colossal size but I usually just buy the medium. This is 1.5 pounds. For the sauce you will need Cayenne or red pepper, horseradish and ketchup. Basically you will use equal parts of the ketchup and horseradish and then you can add in the red pepper according to how spicy you want the sauce. 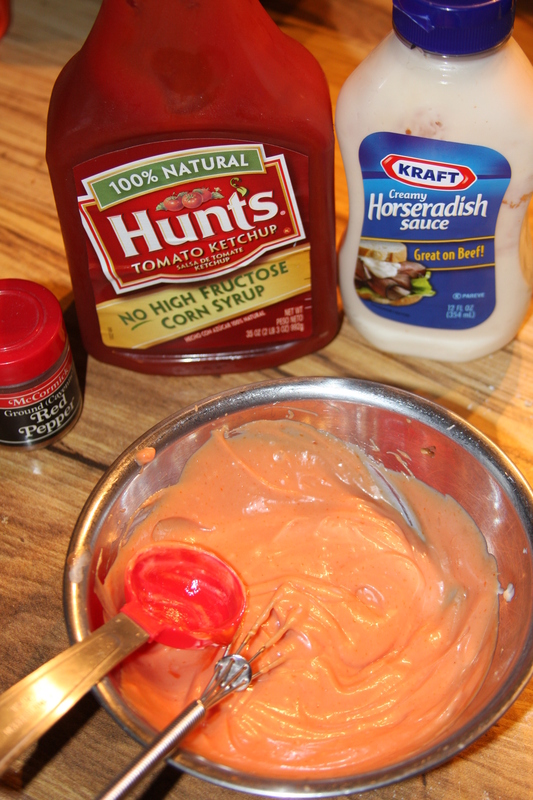 You can also add in a little bit of mayo to offset the horseradish if you want to. I never measure this out and I forgot to do it this time to give you an exact recipe for it. Just start with equal parts and go from there according to your taste and adjust accordingly. 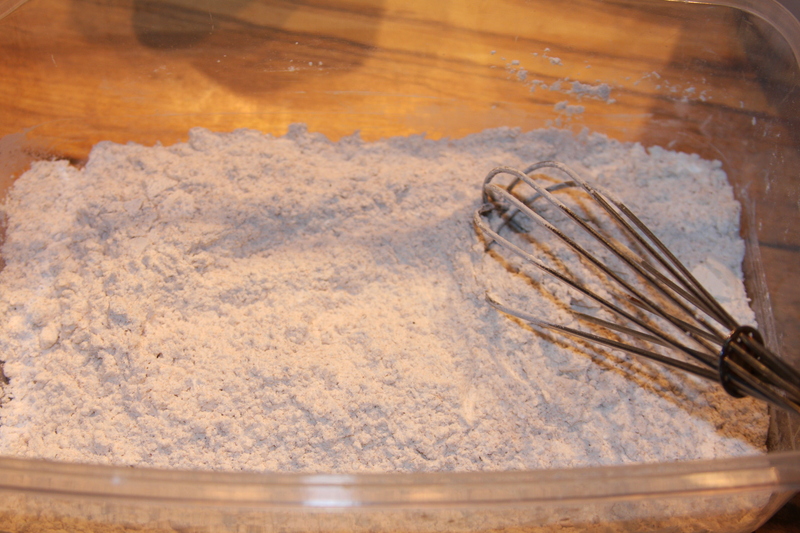 Just use a small whisk to make sure all the ingredients are well blended and smooth. 3-4 tablespoons of each is usually enough for the 1-2 pounds of shrimp I cook. 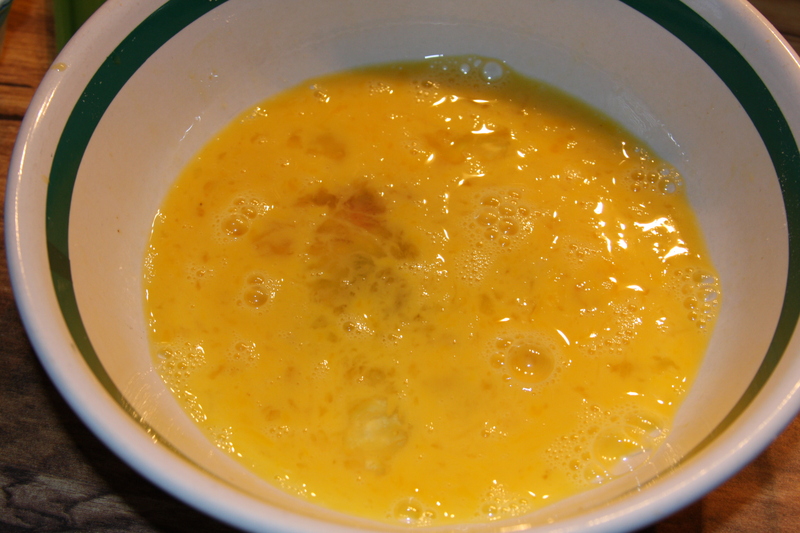 Crack open a couple of eggs and whisk them up in a large bowl. Coat all the pieces of shrimp in the egg mixture. I always throw in all the shrimp at once in this bowl because it is big enough to hold the whole 1.5 pounds. Just make sure every piece is coated well. 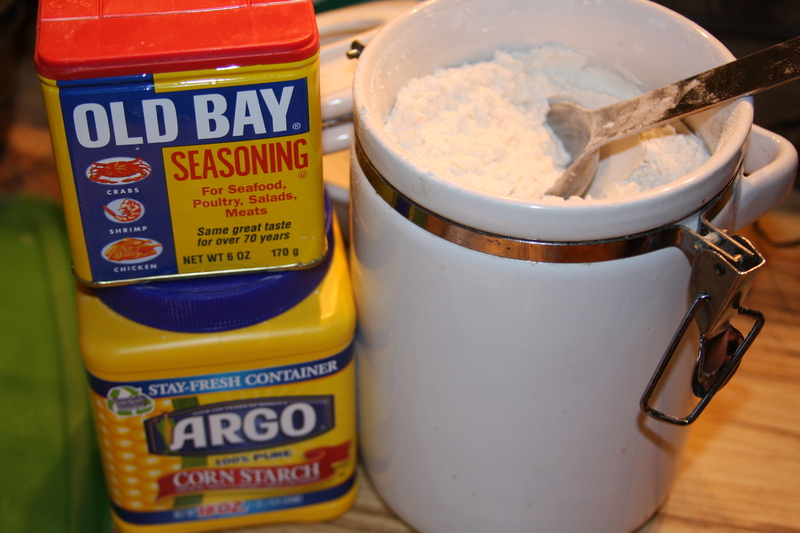 Mix in equal parts of flour and cornstarch and then season those with the Old Bay seasoning. You can add as much or as little as you want to. I never measure this either but start with about 3/4 a cup of flour and 3/4 cup of cornstarch and then shake in the Old Bay until you can see it in the flour mixture. I like to use a container with a lid for the battering the shrimp. 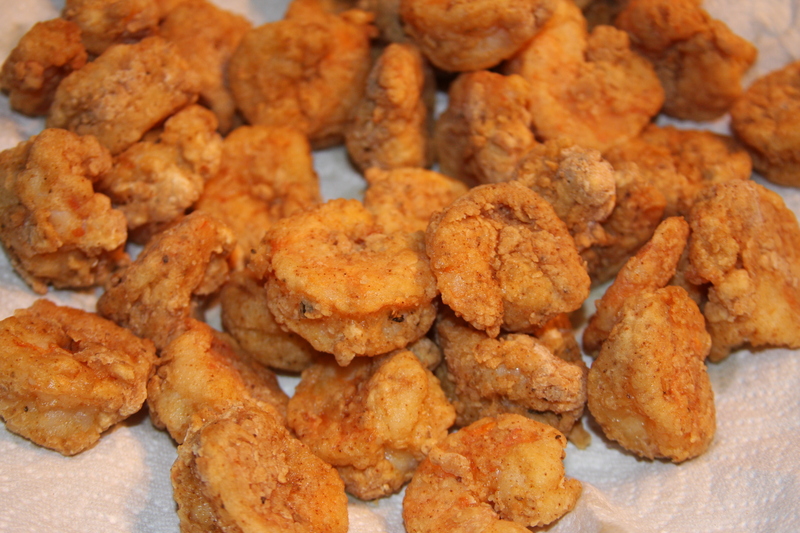 I just throw in a few pieces at a time, put the lid on and give it a few good shakes until the shrimp is coated. 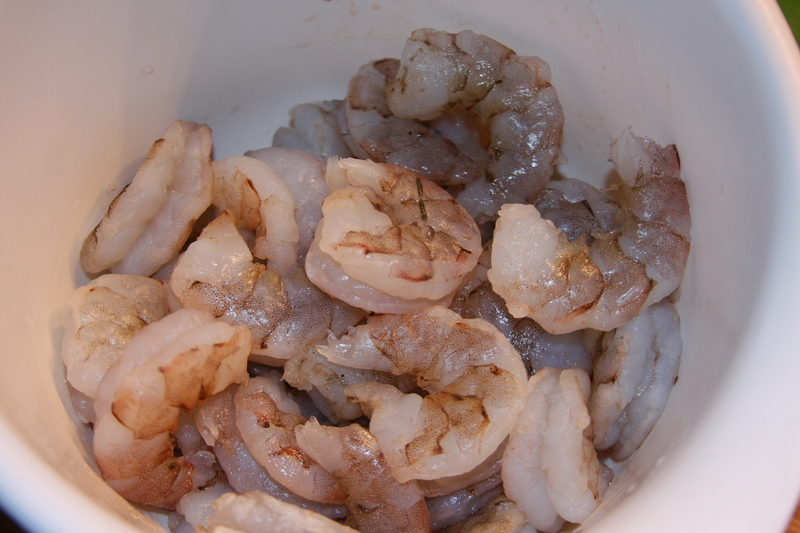 Take out those pieces and lay them aside and continue the process until the shrimp are all coated in the batter. I don’t have a picture of this, but the next process is to deep fry them. You can use whatever kind of oil you prefer and you can fry them in a skillet or in a deep fryer, whichever you have. Shrimp cook pretty fast and you don’t want to overcook them or they will taste weird and who wants to eat weird tasting shrimp? You are going to cook them for about 2 or 3 minutes at the most, or just until you can see through the batter that the flesh is pink. Remove from the oil and let drain on paper towels. Serve with the sauce. These are little bites of OhMyGoodyGoodness for sure! This entry was posted in Appetizers, Dinner, Gluten-Free, Lunch, Products, Recipes, Sauces, Seafood, Sides, Snacks. Bookmark the permalink. I made these for dinner tonight and they were wonderful! I also made the dip but I didn’t have the horseradish sauce so I just used plain horseradish and mayo combo in equal parts with the ketchup. I may never order fried shrimp in a restaurant again! Thanks for sharing the recipe! I am so glad you liked them!! They are just so good, truly one of my favorite dishes! Delicious recipe, I will have to remember to buy some Old Bay seasoning, I usually just use salt and pepper, but that sounds much better. Thanks for the blog post! Definitely better with the Old Bay. This recipe has been a favorite of our family and friends for years. I hope you give it a try! You should do some new recipes, you have a great touch for cooking and take great pics! Thank you so much. I have been super busy this year, but am planning to upgrade the blog to make it more user friendly and add more new recipes. Hopefully that will all happen by the fall! I made this and it was wonderful. THANK YOU SO MUCH. Thank you so much for letting me know! I am so glad you loved it! This is a family favorite and requested by all of our friends!